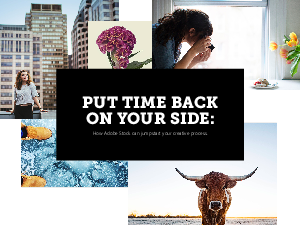 > Adobe > Put Time Back on Your Side: How Adobe Stock can jump start your creative process. Today’s customers expect personal experiences no matter where they are, on every device. For you, this means creating new content that’s specific to every product, for every customer segment, every screen size, and every step of the customer journey. Demand is at a larger scale than ever before.